A year to remember: 2016 was a record year for Malaga airport, with an extra two million passengers compared with 2015, bringing the total to 16.6 million. Figures issued this week by the Aena airports authority showed a growth of 15.7 per cent, almost three times the increase registered in the previous year. Another figure which demonstrates the attraction of Malaga province for tourists is that the 51 companies who operate at the airport (eight more than last year) are expecting to run nearly 80,000 flights. There will be 13,483,020 seats on the 220 routes which connect Malaga with the rest of the world. During the peak season last year, there were nearly 70,000 flights to and from this main airport for the Costa del Sol. This year the summer season is being extended until 29th October, with an extra 10,000 flights, which is an increase of around 13 per cent. 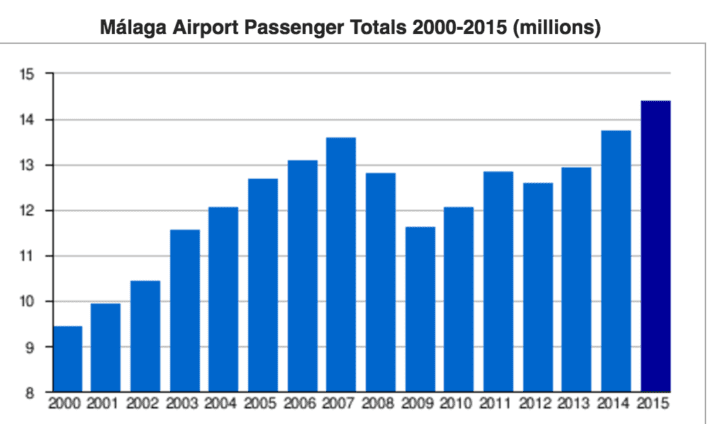 There has been considerable growth in business at Malaga airport in recent years. In peak season last year there were 2.1 per cent more airline seats available, and an extra 15 per cent are scheduled for this summer. Even in the winter, there were 8.5 per cent more flights operating from Malaga and 10.5 per cent more seats than in the previous winter. Nearly five million passengers travelled on 30,100 flights from the end of October 2015 until last Sunday. It has also just been revealed that the number of foreign travellers to Andalucía in the first two months of the year has exceeded one million for the first time ever. Despite January and February traditionally being the lowest months in terms of tourism, a total of 1,007,345 visitors came to the region from abroad during those months this year, which was an increase of 17.4 per cent. This summer, Malaga airport will have direct flights to 123 destinations around the world, three more than last year. In terms of passengers, the UK still tops the list as the strongest market for Malaga, with 16.3 per cent more seats (over 4,400,000) and 14.1 per cent more flights. Next comes the Spanish market, with more than 1,770,000 seats and 12,800 operations, an increase of 5.5 per cent. However, the biggest increase is in the German market, which saw a slight setback last summer but is now running 12.1 per cent more flights and a total of around 1.1 million seats. If there are no last-minute changes, the airlines are planning to run 6,200 flights between Malaga and Germany, which is 12.5 per cent more than last year. There are also some new routes, including one to Kuwait, which will have at least 30 departures although neither Aena nor the airline have been able to give precise figures. However, what is really noticeable is that there are improved connections with the United Kingdom, specifically to Birmingham, Norwich, Glasgow and Newcastle, more flights to Copenhagen, Moscow and Berlin, and new ones to Dresden and Erfurt. More flights have been planned to Marseilles and Deauville in France , to Stockholm, in Sweden, and to Eastern European cities, such as Bratislava in Slovakia and the Polish capital, Warsaw. Due to increased demand from the Moroccan market, there are extra flights to Tangiers, and due to their popularity there will also be more connections with Gran Canaria and Tenerife. The strong growth at Malaga airport from now until October is the best sign that the Costa del Sol can expect a great summer, and may be yet another record year for tourism.